The 20th edition of Principles of Auditing & Other Assurance Services provides a carefully balanced presentation of auditing theory and practice. 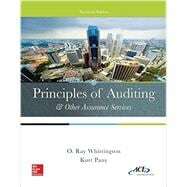 Written in a clear and understandable manner, it is particularly appropriate for students who have had limited or no audit experience. The approach is to integrate auditing material with that of previous accounting fi nancial, managerial, and systems courses. Appendix C Illustrative Audit Case: Keystone Computers & Networks, Inc. Appendix A Illustrative Audit Case; Keystone Computers & Networks, Inc. Appendix B Illustrative Audit Case: Keystone Computers & Networks, Inc. Appendix A Illustrative Audit Cases: Keystone Computers & Networks, Inc.